We've reached the end of another week already. This has been a good week for me, I've been really busy and I've had two successful driving lessons. Hopefully within the next 6 weeks I'll be able to take my test after four years of on and off learning! I have a new polish to show you, new to me anyway, I'm not sure how long it's been out but I haven't seen it before and I spend a lot of time in H&M! It's called Blue Bliss and it's a sheer blue jelly base filled with iridescent blue and purple glitters that sparkle to show green, copper, pink and lots more depending on how you look at it. The formula is good on this, it's easy to apply and the glitter spreads out well. The base is very sheer though. Normally I'd use this for layering but I wanted to see how long it would take me to get it opaque, so I did coat after coat after coat! It looked so pretty! 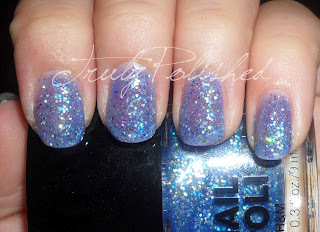 The photos below show four coats of Blue Bliss with one coat of Seche Vite. I loved the look of this on it's own and I'll wear it like this again, but only when my nails are shorter. The VNL was killing me! I'm in the search for the perfect colour to match this for layering, but I'm eager to layer it over black to see what the iridescent glitters look like, so I'll be sure to post photos when I do. This polish is available at H&M for £2.99. Don't forget my giveaway is still running! It was meant to end at 4am tomorrow morning but I have extended it to run until Monday morning at 4am, midnight EST on Sunday night for any American people who have entered. I will be announcing the winner on Monday so I figured I might as well run it until then... You can enter here! Have a great weekend and see you on Monday!!! Isn't it just? I love it! Keep your eyes peeled! It's a real beauty, well worth buying! I know righty? Couldn't believe my eyes when I saw it!